What’s in a name? A lot, if you’re Florida-based company Rich Cigars Inc.
Rich Cigars Inc, a company that until yesterday said its primary purpose was to “distribute, brand and market tobacco products,” today announced that it was changing its name. Rich Cigars said it would henceforth be called “Intercontinental Technology Inc”, and instead of manufacturing cigars, it would now be mining bitcoin. 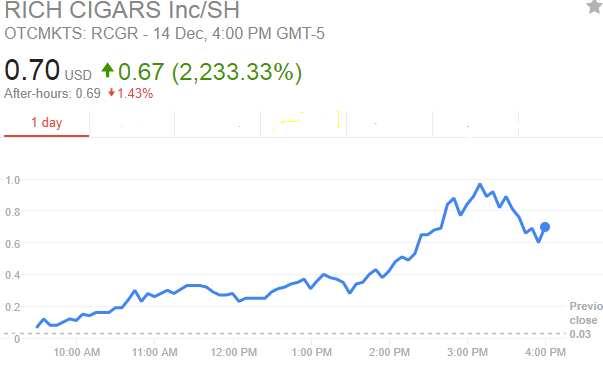 Its stock shot up 2233% immediately following the news. Before the news broke, Rich Cigars traded at $0.03. The day following the news, its stock opened at $0.07, which instantly more than doubled its trading price. Through the course of the trading day, its price steadily rose, ending at $0.7, representing a 2233% gain in one day. Someone who’d invested Rs. 1 lakh into the stock at 9 am would’ve seen it become Rs. 22 lakh at 4 pm. It’s not the first time a company’s stock has shot up with the merest hint of crypto-currency in its business operations. In October this year, a company had seen its stock rise 394% in one day after it had simply added “Blockchain” in its name. Investors, it had appeared, had chosen to value On-line Blockchain Plc significantly higher than the company’s previous name, On-line Plc. If you think that’s strange, it’s no less strange than what’s happening to cryptocurrency prices this week. Bitcoin has more than doubled in value for no apparent reason, and other cryptocurrencies are following suit. Even as major cryptocurrencies are furiously trying to disrupt gold, anything they’re touching is turning to gold at the moment. Update: This article has been updated to correctly reflect a 2233% gain on a Rs. 1 lakh investment.